Bangkok (Thailand) – October 29, 2018 (travelindex.com) – The Ministry of Science and Technology, with support from Mahidol University, N.C.C. 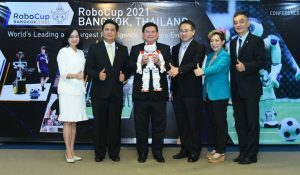 International Events Co., Ltd. (NCCIE) the Thailand Convention and Exhibition Bureau (TCEB,) and the Bangkok Metropolitan Administration (BMA,) has formally announced that Thailand will host the RoboCup 2021in Bangkok in June 2021. The event is expected to firmly establish Thailand as the ASEAN’s robotics & automation leader. The RoboCup Federation has chosen Thailand as the host of RoboCup 2021 because of the country’s potential; the Kingdom hosted the RoboCup Asia-Pacific earlier in December 2017, which saw more than 1,500 contestants from 14 nations across the world. Moreover, Thailand has been a regular participant in the RoboCup competitions, winning several awards from the RoboCup Federation. “RoboCup 2021 also promises to provide guidelines on how to efficiently integrate robotics to manufacturing, tourism, agricultural, service, medical, education and entertainment industries,” added Suthakorn. Mrs. Supawan Teerarat, Vice President, Strategic and Business Development, TCEB, was of the opinion that mega or world-class events rank among economic drivers that deliver tangible benefits. “With regard to RoboCup 2021, we have worked with Mahidol University and N.C.C. International Events in bidding for the right to organize this mega event in Thailand and we have integrated collaboration from all relevant government agencies in support of the event. The event will be a boost not just for industries related to smart devices, robots, and automation for Thailand 4.0’s new economy goal, but also to the tourism industry, since general tourists as well as experts in the field of robotics and automation are expected to visit,” she stated. “We are determined to organize more events for robotics and automation in the future. We intend to hold such events on a regular basis so as to make Thais’ robotics abilities internationally recognized and present Thailand as ASEAN’s robotics leader,” concluded NCCIE’s Pattarapreechakul.